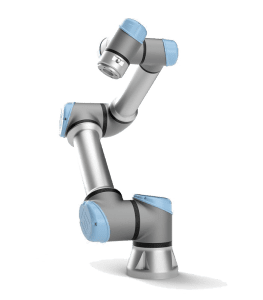 Universal Robots have developed a range of highly specialised, flexible, low-cost collaborative robots that can be used in almost any industry where traditional robots are too large, expensive, noisy or inflexible. We have helped customers to automate handling, coating, pick and place and gluing applications, amongst others, across a wide range of sectors. 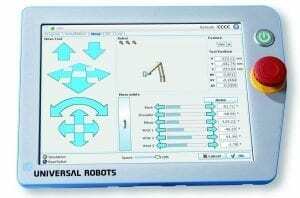 Due to their unique design, Universal Robots do not necessarily require safety guarding (subject to your own application risk assessment), and hence they can work collaboratively alongside humans. 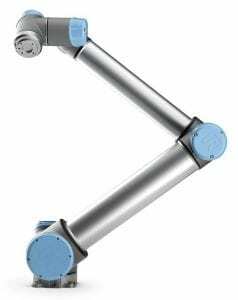 The Universal Collaborative Robot arm is much more compact than most other robots making it ideal for applications where access is restricted such as machine tending. With +/- 360 degrees rotation on all axes it is also incredibly flexible. User friendly software makes programming straight forward. Setup is quick and easy meaning the robot can be in production from day one. Olympus can assist with any tooling to suit the customer’s needs, for example mechanical grippers, vacuum cups, quick change facilities, welding equipment, etc. 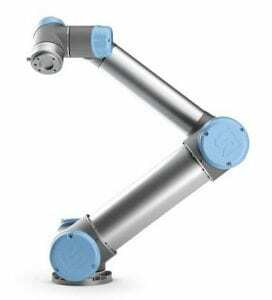 Universal Robots are available in 3 different sizes, the UR3 (3kg payload), UR5 (5kg payload) and the UR10 (10kg payload). 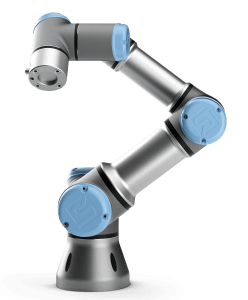 The robots are light enough to move around your factory, allowing you to consider automating several lower volume processes in the same investment.